After 12 months, the regular APR of between 12.15% to 28.15% will apply. This rate will vary with the market based on the prime rate. 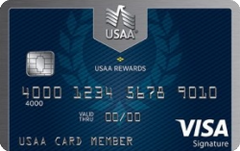 Our take: The USAA Rewards Visa Signature card's mediocre points system is unlikely to thrill veteran rewards cardholders, but its military-exclusive benefits make it a standout card for service members.